Pneumatic Timers are popular industrial components that are uses in fields where an electrical current is considered destructive and dangerous. In many industries, oil, gas, and other flammable substances are used on a daily basis. One tiny, electric spark could cause a fire of dramatic proportions. In order to limit such foul occurrences, devices that are powered by air and inert gasses are used in place of electrical components. Pneumatic timers can help limit electronic fires in industries that have a high risk of fire. Instead of using an electrical current, these devices utilize a piston and control valve that is powered by a consistent air supply. The air supply moves the piston back and forth towards the conclusion of the chamber. Environments with high amounts of moisture and dust are excellent locations for pneumatic timers because there is no danger from explosion or electrical shock. Water can even splash on the device without affecting its ability to function. The Pneumatic time is composed of a timing disk, filter, diaphragm solenoid coil, operating spring, and a solenoid coil. When powered, the solenoid core inside the pneumatic timer travels into the coil, causing pressure to apply on the diaphragm. When pressure is present, the diaphragm moves into the top chamber, which entraps air in the chamber. The trapped air is subsequently expelled through the needle valve timing disk. The severity of delay is heavily dependent upon the needle valve; the amount of delay can be adjusted by altering the valve. Inert gases can be used in place of an air supply. The definition of an inert gas is: a gas that does not undergo chemical reactions under a specific set of conditions. Inert gases are typically used to circumvent any unwanted chemical reaction; for industrial industries, the undesired reaction is the presence of fire. Pistons are an integral component of any pneumatic timer. They function by controlling the speed of air in the system. The valve at the end of the chamber prevents air from leaving the timer too quickly, which allows the precision of time to be set. 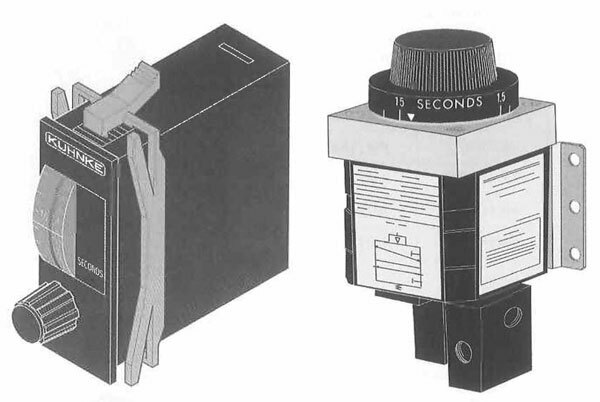 Pneumatic timers allow controllers to dictate how much time will pass before the piston opens a chamber. With the dial, operators are able to control how far the valve opens when the time is functional. By having access to such precision, industrial facilities can obtain complete timing precision without the presence of an electrical timing component.